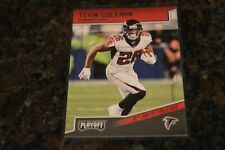 2015 Topps Chrome TEVIN COLEMAN ROOKIE #T60R-TC RED JERSEY CARD. Condition is Like New. Shipped with USPS First Class Package. 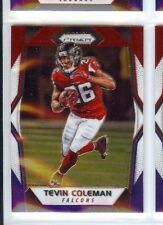 Player - Tevin Coleman [Rookie Card]. Team - Atlanta Falcons. Card # - 121. Sale Includes - (1) Football Card. Sport - NFL Football. Card Type - Base. Players: Justin Hardy & Tevin Coleman. Insert: Rookie New Generation Duals Jersey. EXCELLENT QUALITY PRODUCTS. GREAT PRICES. All cards are NM-MT unless noted otherwise. Also, check the pictures on all item types for condition. I will try to be as descriptive as possible on condition. Card is nrmt to mint. If you're looking for more value, feel free to check out our selection of sports trading cards. THE CARD IS IN MINT CONDITION. NICE GIFT FOR THE FAN THAT HAS ALMOST EVERYTHING. THIS IS A GREAT WAY FOR THE INDIANA HOOSIERS, ATLANTA FALCONS, OR TEVIN COLEMAN FAN TO DISPLAY THEIR LOVE FOR THEIR TEAM OR FAVORITE PLAYER. 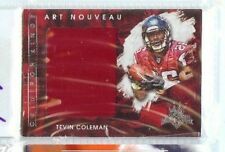 Tevin Coleman 2017 Select Swatches Copper Prizm Relic Card 33/49. Condition is Like New. Shipped with USPS First Class Package. 2015 Leaf Clear Draft Auto TEVIN COLEMAN. College: Indiana University. NFL team: Atlanta Falcons Football insert card #BA-TCI with signature. Coleman is a rookie, drafted in the third round in 2015. Flawless Progressions Tevin Coleman Auto Rc Serial 22/25 Falcons NFL PSA Shipped with USPS First Class Package.